Because we work well under pressure, you won’t feel it. 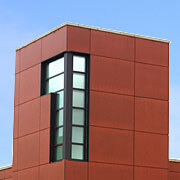 Note that the phenolic panel section on our Web site is a rainscreen system. Just about any façade material that isn’t part of the vision glass area can be installed as a rainscreen system. It’s the vapor barrier and the pressure equalization that keeps the water from penetrating into the building. As long as the air flow behind the system is equal to the exterior it will not be sucked into the building by the mechanical draw. It’s all about maintaining balance, in our projects and in our process.